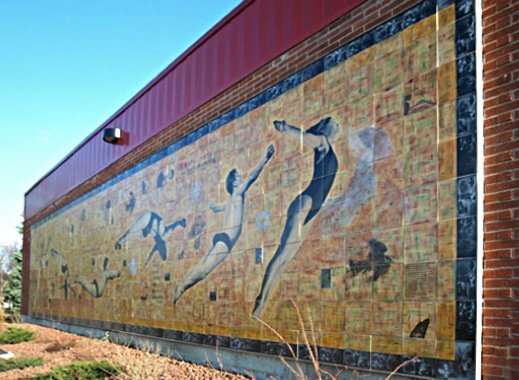 Ancient Movements is a photo-screenprinted mural installed on an exterior wall at the Red Deer Recreation Centre. There is the odd word interspersed throughout it that reflects the theme of the mural and the building it is mounted on. There is however, a small tile subtly placed that contains a description of this area by one of the first pioneers to settle here. "Considering the Recreation Centre is devoted to health, wellness and play, I have used imagery that reflects our search for physical and spiritual health, while evoking a sense of place through depictions of the city’s history and natural environment. My hope is that the images will appeal to people on a personal level but also cause them to reflect from a broader community and cultural perspective."